Please join us! Doors open at 7:30pm. To purchase your tickets, go to www.space538.org. And to find out more about Zapion, go to www.zapion.org. Visit the Facebook event and share with your friends! Tickets are $12 in Advance; $15 the day of the show. FMI about the musicians, go to www.zapion.org. Performing for Tips: Suggested $10 per person. Special Guests: Anabee & Friends, Dorothea, Nasreen and Sahar. Middle Eastern Dance Party with Zapion! Belly Dance with Josephina is pleased to host the 3rd Annual Middle Eastern Dance party with Zapion! This is your night to dance, dance, dance!!! If you have belly dance items to sell, there will be a table available. Mark your items with your name and the asking price. Tickets are $10 in Advance; $12 the day of the show. Special Guests: Anabee & Friends, Dorothea, Nasreen and The Village People. Authentic Belly Dance is proud, powerful and a lot of fun! The emphasis will be shimmies, isolating movements emanating from the core. Every body type is celebrated! Jingling Hip Scarves will be provided. The workshop is free for students in grades 6-12. Space is limited. Registration is required. Please call 443-5141, ext. 12, to sign up. Community Room, Patten Free Library, 33 Summer Street, Bath, ME 04530. Belly Dance with Josephina is pleased to host the 2nd Annual Middle Eastern Dance party with Zapion! TICKETS ARE ON SALE AT THE DOOR. Middle Eastern Dance Party with Josephina and Zapion! Come dance to live Middle Eastern music! I'm pleased to host this event with Zapion Middle Eastern Ensemble. 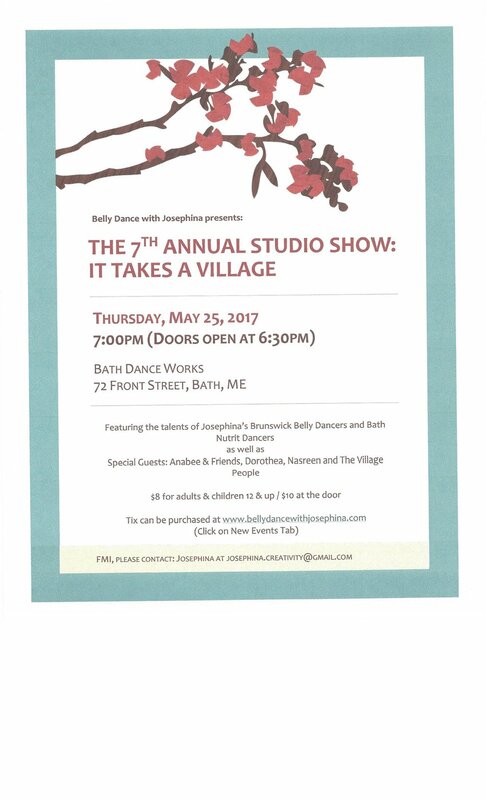 Doors will open at 7:30pm at People Plus, 35 Union Street, Brunswick, ME. Mezze and drinks will be served. And there will be a table available for anyone interested in buying or selling belly dance costumes. Tickets are $12 in advance; $15 at the door. Join us for an evening of traditional music and dance from the Middle East. Jamileh, one of Maine's most celebrated belly dancers, will collaborate with dancers Josephina, Dorothea, Sahar, and Nasreen, as well as the special sextet version of the Zapion Middle Eastern Ensemble. The Zapion trio of Eric LaPerna, darbuka; Maria Wagner, clarinet; and Duncan Hardy, qanun; will add Carl Dimow, guitar; Simon Moushabeck, accordion; and Jamileh's son, Halim Moldaver, riqq and duff; to their Turkish nightclub sound. Audiences have described Jamileh's shows as “elegant”, “breathtaking” and “authentically Arabic." Friday, March 11, 2016 at 8pm (Doors open at 7:30pm) at Space Gallery, 538 Congress Street in Portland. $12 in advance, $15 the day of the show. I'm pleased and excited to be part of this group of amazing performers. I hope you can join us for this evening of live music and dance.